The Takeaway: A lot of sales are at stake during the back-to-school shopping season, and if your brand wants to earn a majority of the revenue available, you must target moms with perfectly detailed product content. Back-to-school shopping season is coming. A report from Rubicon Project said that parents plan on spending an average of $917 on each of their children in the next three months and if those kids are headed to college, that amount rises to $1,300. All said and done, eMarketer predicted that ecommerce and brick-and-mortar retailers will earn 17.2 percent of their full-year retail sales - or $828.81 billion - over the course of July, August, and September. And for ecommerce retail specifically, the back-to-school season will generate $65.42 billion in sales. "Moms will spend $600 in the next three to four months on their children alone." When broken down into product categories, technology takes the cake for highest expected spend ($343), and dads are most likely to make the purchase decisions when laptops, smartphones and other electronics are needed. But technology is just one small part of what's to come. This back-to-school shopping season, moms are in charge of buying school supplies, apparel and more, and individually, these shoppers have around $600 to spend (on each of their kids) in the next three months. So, let's dig into some consumer research - our own and other experts' - to identify moms' shopping behaviors. Between bringing kids to baseball games, carting the squad to dance recitals and making dinner, moms have little time to sit down at desktops. That's why mobile devices are such common shopping tools for this demographic. Our report "Cracking the Consumer Code" indicated that moms are 30 percent more likely to shop on mobile than other adults, and they are 43 percent more likely to click "Buy" on their smartphones. During back-to-school shopping season, moms' purchasing behaviors won't change a whole lot. AdWeek cited a Penn Schoen Berland survey that found 60 percent of parents will purchase at least one item on their mobile devices in the next few months, and 30 percent will complete a quarter of their shopping this way. Even more indicative of larger trends, 60 percent start their shopping experiences on smartphones or tablets. "Two-thirds of moms use mobile devices throughout their entire path-to-purchase." "Mobile will be bigger than ever and very important for influencing the purchaser [this back-to-school season]," Jeanne McPhillips, vice president of merchandising at Overstock.com, told eMarketer. "Mobile is part of everything - you look at email on your phone and you look for information on your phone. We have conversations with our partners about how we can present things better on mobile. How can we make images better on mobile? How can we present this value prop, such as a daily deal, on mobile? What ways can we get in front of a customer to engage them? Maybe they don't make a purchase on mobile, but it's the first place they engaged with us." Moms are going into stores armed with information this back-to-school shopping season, and they're looking for product content online while in-store. So, while Rubicon Project noted that dads are impulse shoppers, moms are focused on making purchase decisions after getting all the facts. And while moms want all the product content that they can get, they really only have time to read the most important product information. 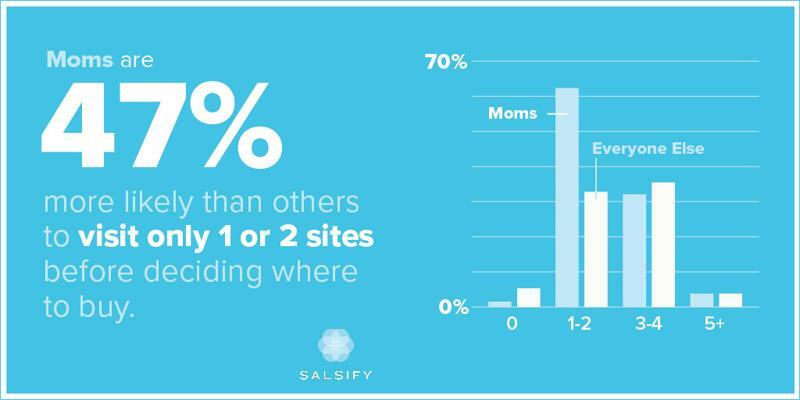 Our survey found that moms are 47 percent more likely than other shopper demographics to visit only one or two sites before deciding where to buy. After all, their schedules are full, and they don't have a lot of time to search the internet for the product content they need to make a smart purchase. That means your brand needs to get your product content on each and every ecommerce channel. Download our consumer research report, "Cracking the Consumer Code," for more insights into shoppers' behaviors. How else do moms shop? Moms put a lot of faith into reviews, and when brands take advantage of user-generated content like that, they see major increases in conversions - 54 percent in the consumer electronics space, according to BazaarVoice. For the 2016 back-to-school shopping season, there are a few major takeaways. First, your brand should target moms. Second, that means that you need to inform those shoppers if you want them to buy. Lastly, you still have time to improve your product content with mobile-optimized photos and product page layers, as well as with product reviews.